Chasewater as it was mapped in 1884. This was a 1:2,500 scale draft by the Ordnance Survey. There is a correction tear near the north of the lake - sorry, that's done by the mapping service to keep the sheet accurate. Click on the image for a larger, legible version, but be warned - it's 7 meg in size, so could take a while. 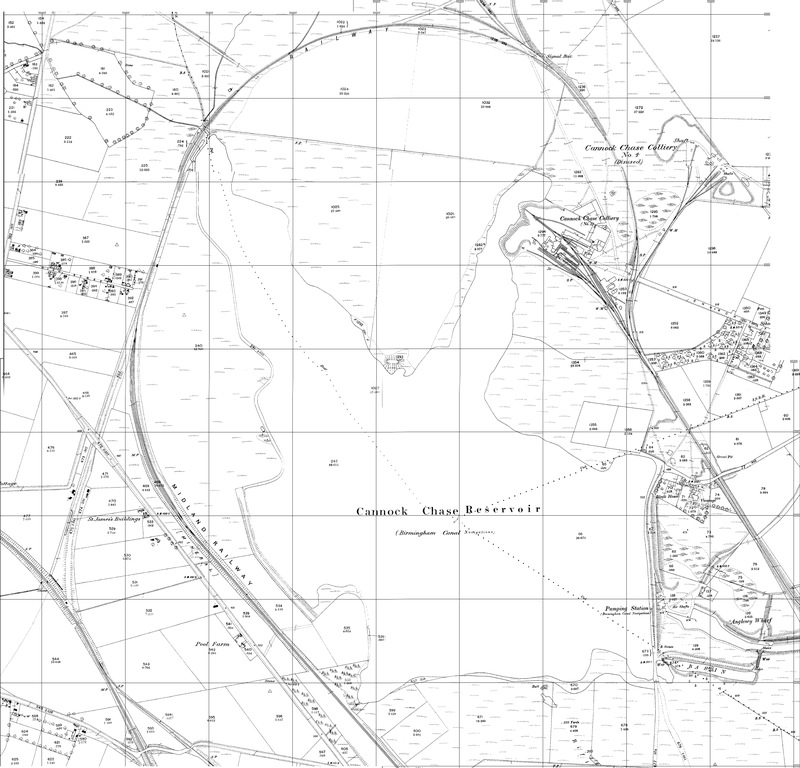 Further to Graham Evans’ request, here’s a map of how Chasewater was around the late Victorian era. There’s much that’s of note here – the shape of the lake, the pits and surrounding railways. Note also that Jeffrey’s Swag doesn’t appear to exist. This map has taken about three hours to assemble from a mixture of digital and printed fragments – all from the same 1884 series, which is the earliest at this scale. It has been priced together using digital imaging software on an Apple Mac – without this, the job would be much harder. You can download a PDF file of this map by clicking this link – it’s just over 14 meg but well worth it for the quality of image. I’m hoping to turn this into a Google Earth Overlay at some point – others will follow as time permits. I’d like to do the 1919 particularly, although that could be tricky technically. Please stay tuned. This entry was posted in Brownhills stuff, Chasewater, Environment, Features, Followups, Fun stuff to see and do, Local Blogs, Local History, Local media, Reader enquiries, Shared media, Shared memories, Social Media, Walsall community, Wildlife and tagged Brownhills, Brownhills local history, Canal, Chasewater, Chasewater Dam, Chasewater Wildlife Group, Cycle rides, cycling, Graham Evans, local blogs, Local History, Old maps, Reservoir, Staffordshire, Wildlife. Bookmark the permalink. Thanks so much Bob, its like Christmas has come early this year! If you can do the same for 1902, 1919 and 1962, or any other years you may have, it will help to unfold the site’s history immensely. Cheers.